An international mix of foods, crafts, and jewellery from across the globe will be coming to Haverhill next month (8 April- 9 April). Queen Street will host the first World Village Market from 9am to 5pm both days, while Saturday will also see Haverhill host its first bring and buy sale specifically for youngsters looking to sell their unwanted books, films, homemade arts and crafts, plus other items. 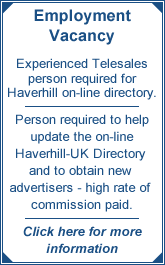 The regular Haverhill market will also be taking place on both days. The World Village Market is being run by Market Square Group on behalf of St Edmundsbury Borough Council and offers a range of foods including Paella and Churros from Spain, freshly cooked Chinese street food, home grown chilli products, cheese and chutneys while you will also be able to buy some American craft beer to wash it down. There will also be stalls selling crafts, clothing, jewellery and other accessories. The council worked with Market Square Group to hold the very successful beer festival in the town last year. Live music will be provided by a steel drummer on the Friday between 11am and 3pm while talented singer songwriter Pembroke Tenneson will perform on Saturday afternoon. The Market Square Group is also looking for local people and traders to take part in the event – contact Paul Kennedy on 07944 599 165. Cllr Alaric Pugh, St Edmundsbury Borough Council Cabinet Member for Planning and Growth said: “We have had Continental markets in Haverhill in the past but this is the first World market to be held in the town and I’m sure that it will be worth a visit, not just for the people of Haverhill but also for visitors from further afield. “This event will bring culinary tastes, crafts and entertainment from across the globe to the very heart of Haverhill.